I was inspired to read this by the fact that my fourteen-year old son is reading it for his ninth grade English class. I read The Grapes of Wrath years ago, and more recently, East of Eden, and enjoyed those enough to consider myself something of a fan of John Steinbeck’s writing. 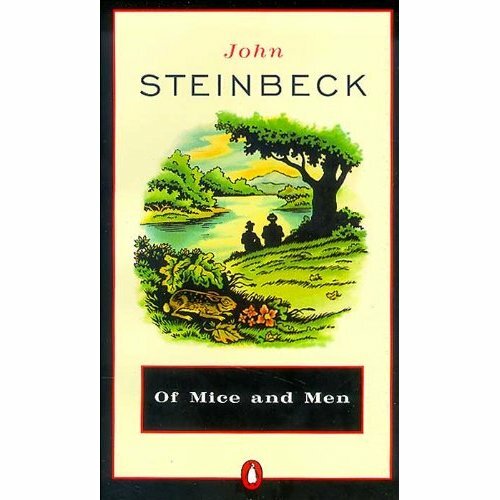 The particular edition I have of Of Mice and Men begins with a twenty-five page very scholarly introduction, examining and explaining the themes found throughout the story, as well as Steinbeck’s motivation and state of mind surrounding his writing of the book. These kinds of introductions tend to intimidate me; it usually tells me that the story contains some deep, obscure philosophical meanings that are probably going to fly right over my head. I’m not going to try to analyze the themes in the book too much, because I just don’t feel qualified. Instead, I’ll give you a synopsis of the story and tell you how I felt about it. This slim novel, at just barely over 100 pages, is a tightly wound, intense story, populated by characters who have an almost mythical feel to them. At the heart of the story are George and Lennie, both transient farm workers in California during the 1930s. Lennie is a giant of a man with the mind of a child; George is a scrappy, hardened man. The two men travel, looking for work together, which makes them an unusual sight; at the time, sticking together while living the life of a migrant farm worker was extremely rare. So what keeps these two together? On the surface, George, while physically much smaller than Lennie, tends to be rather cold and callous to the feeble-minded Lennie. Lennie follows George like an obedient puppy. A deeper look reveals a caring and loyalty between the men; although a tireless laborer, Lennie is incapable of thinking or caring for himself, and George has taken on the role of Lennie’s caretaker and protector. They share a dream of socking enough money away to buy their own piece of land and “livin’ offa the fatta the lan’.” This shared dream is really what keeps them from falling into an abyss of hopelessness, for it is a hard life they lead. Full of foreshadowing, events unfold that are both not surprising, but still shocking. “It is a parable about committment, loneliness, hope, and loss,” and, in my view, mercy. It is, ultimately, a tragedy. I think this story is going to stay with me for quite a while. I am very interested to talk about this book with my fourteen-year old when he finishes it. Have you read East of Eden?